The Latest with David Jay: OSP SOUTH! I'll post up about PhotoPlus tomorrow but first I'm super excited about OSP South! I can't believe it's just two weeks away! 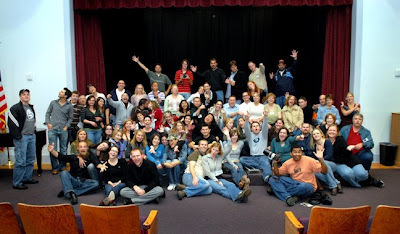 I even went and found some pics from 2006 and it got me even more amped to see all of you! I was talking to my friend Markham from SmugMug and he is hooking up 5 of the contest winners with a FREE account for a year and is hooking up [b]everyone[/b] who comes to OSP South with these really nice camera straps and a 50% discount on the first year of SmugMug! He'll pop onto OSP and share more and feel free to ask him anything you'd like. Anyway, I just wanted to introduce all of you to him b/c they are gonna be making some big announcements soon regarding a new pro-lab offering as well as some killer customization options that you've all been waiting for. Hey DJ, those SmugMug camera straps you guys gave out in Atlanta ARE really nice! Where can I get more?? I lovin my SmugMug Pro account, and look forward to hearing about the new pro-lab offering! Hurry, Hurry, Hurry with those Smug Mug updates! I am LOVING my Smug Account so much and just kicking my self in wondering why I waited so long to switch from the "other guys". DJ, you ROCK! Hook me up with one of those straps! Smugmug and a pro lab will be great news. I've been doing Z things lately as an option to P, but I've had my pro Smuggy account for years and once they have real lab options they'll get everything from me again. oh cool DJ, I can't wait for the news. Thx dude, you totally Rock!!!! I love SmugMug! What is OSP South? I haven't heard of it... I live in Florida... can I come?? Plus there is a 50% off your first year coupon that will be announced there. DJ will announce it. Yesterday's Video Chat was awesome! Best part of the Debate! Sites LIVE Q&A was rocking!